Abbey Fishman Romanek, a former Assistant Attorney General and an insurance defense practitioner with several Chicago firms, is planning to run for judge in the 9th Subcircuit in the February 2010 primary. Ms. Romanek already has a website up and running; a link to the site has been established in the sidebar. Her campaign bio notes that, "In 2006, Abbey decided to devote herself to her family and community fulltime while still maintaining a small law practice on the side." Ms. Romanek has sought judicial office previously; another page on her website displays favorable ratings from the several members of the Alliance of Bar Associations for Judicial Screening. The Illinois Supreme Court struck down the Compulsory Retirement of Judges Act this past Thursday in Maddux v. Blagojevich. Cook County Law Division Presiding Judge William D. Maddux filed suit attacking the law in 2007; I wrote about the suit when it was filed. There is no rational basis upon which the legislature can prevent 75-year-old or older former judges from running in an election, but not citizens 75 years old or older who were never judges when the disqualifying characteristic is age. If the legitimate state interest is to insure a “vigorous judiciary,” the classification we describe above cannot be deemed rationally related to that purpose. We stress again that if age defines ability (and both the constitutional and legislative history indicate that it was believed that it does), either all those 75 years of age or older are unfit or they are not. No presumption of constitutionality could save legislation like this that so blatantly violates equal protection. The Supreme Court's majority opinion was authored by Justice Charles Freeman, himself 75 and, because of this opinion, now eligible to seek retention in 2010, should he so choose. Abdon M. Pallasch, writing in Friday's Chicago Sun-Times, quotes William Schroeder, a law professor at Southern Illinois University, as saying that Freeman's participation in the case, "has the appearance of impropriety. It diminishes the reputation of the judiciary and calls into question the integrity of the procedures. It brings the administration of justice into disrepute and causes the citizens to question the integrity of the process." But DePaul University Law Professor Jeffrey Shaman was not as critical. According to Pallasch's article, Shaman said, "It might have been the better part of discretion if Judge Freeman had not written the decision in the case, but, even so, I don't think this is a situation where he had to disqualify himself from hearing the case." Pallasch also reports that Supreme Court spokesman Joe Tybor said, "I really think it's presumptuous to say it would 'benefit' Freeman." Freeman's accountant told him [Tybor] that with his pension, he would make more money if he retires. Maddux's attorney David Novoselsky said that was true for all the older judges who save taxpayers money by staying on the bench instead of leaving and drawing their generous pensions. "It's really the voters in Illinois who benefit," Tybor said. Local Asian American leaders are outraged, dismayed, and disappointed by the hasty action of the Illinois Supreme Court to fill a seat left vacant by the recent death of Circuit Court Judge Sandra Otaka. Otaka, who died on Saturday, June 5th, was the first and only Asian American elected to serve as a circuit court judge in Cook County. Her successor was appointed just five days after her death -- before the judge had even been laid to rest. "The circumstances surrounding the appointment of Judge Otaka's successor suggests that the decision was made without regard to the changing demographics of the comm unity she served," said Diana Lin, president of the Asian American Institute (AAI). Otaka, first elected judge in 2002, was retained last November in the 9th Judicial Subcircuit District -- home to Cook County's largest concentration of Asian Americans (about 300,000 residents). The public outcry from community leaders came after they learned that the Illinois Supreme Court had appointed, as Otaka's successor, someone with no ties, or familiarity, with the county's Asian American community. Nearly three-dozen Asian American groups (see attached list) are demanding more transparency in the appointment process and pushing for diversity on the bench with qualified candidates. The Asian American Bar Association, which expected to be consulted for recommendations of qualified candidates, had not even been notified that the process to select Otaka's successor was already ongoing. "There are Asian American lawyers qualified to merit consideration for Judge Otaka's vacancy," says Anne I. Shaw, immediate past president of the Asian American Bar Association (AABA). "Given the historic significance of Judge Otaka's election and her stature as a beloved icon for Asian Americans, we had hoped that the Illinois Supreme Court would have exercised some sensitivity to Cook County's Asian American community by giving strong consideration to the prospect of appointing an Asian American, appointing someone with ties to our community or, at least, alerting Asian American community leaders." Asian Americans are the fastest-growing minority group within the legal profession, yet continue to be grossly underrepresented in the judiciary. Otaka championed the effort to increase diversity in the Cook County court system. Her death leaves only six judges of Asian ancestry in the county. However, all six are associate judges -- not full circuit court judges like Otaka. Anne I. Shaw, the President of the Asian American Bar Association in 2007-08, was listed on the release as a contact person and I took the liberty of following up. As I understand the process, while the entire Supreme Court fills vacancies, as a practical matter, the Court acts on the recommendation of the justice in whose district the vacancy occurs. In Cook County, which has three justices, the justices take turns making appointments. These days all of the justices have committees of one sort or another to advise them on appointments. In Cook County the Chicago Bar Association, at least, will be asked to provide an opinion about the merits of proposed appointee. Many persons seeking appointments have sought judicial office before and will have already had their credentials examined by both the CBA and the Alliance of Bar Associations for Judicial Screening. The Asian American Bar Association is a member of the Alliance. In an email to FWIW, Anne Shaw, the former AABA president, acknowledged that AABA had not contacted the Supreme Court about the Otaka vacancy before it was filled. "We are and were mourning Judge Otaka’s death. She was a beloved leader and icon not just in our community, but in the community at large," Shaw said. I have no inside knowledge of the circumstances surrounding how the Otaka vacancy was filled, but it may be that Yehuda Lebovits had already been screened and approved for appointment for the next available 9th Subcircuit vacancy before Judge Otaka's passing. That might account for how quickly the vacancy was filled. Anne Shaw had nothing to say against Mr. Lebovits individually; rather, she said, the Asian groups are calling for "greater transparency in the [appointment] process." "Greater transparency," Shaw said, "would benefit everyone," including the Illinois Supreme Court. "We believe that this will encourage a larger pool of qualified applicants for the Illinois Supreme Court to consider." Michael Ian Bender was appointed to the O'Malley vacancy in the 9th Subcircuit this past October. He now has a campaign website up and running in anticipation of the February 2010 primary. If you know of any other 2010 Cook County judicial campaign websites already up and running, please let me know. Yehuda P. Lebovits, director of the Cook County Expedited Child Support Program, and a Lincolnwood village trustee, has been appointed by the Illinois Supreme Court to fill the 9th Subcircuit vacancy created by the recent death of Judge Sandra R. Otaka. Judge Otaka was the first Asian American elected to the Cook County bench. A lawyer since 1983, Lebovits was among the finalists for the Associate Judge vacancies filled in 2007. A June 2008 Chicago Daily Law Bulletin article notes that Lebovits also served as financial secretary of the Decalogue Society of Lawyers. The Expedited Child Support Program is a collaboration between the State of Illinois, Chief Judge of the Circuit Court of Cook County, Cook County State's Attorney and the Clerk of the Circuit Court of Cook County. You can find out more about the Expedited Child Support Program by following this link. Lebovits' appointment is effective June 25 and runs through December 6, 2010. Geary W. Kull started his judicial career today. 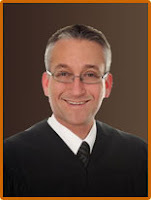 He was appointed by the Illinois Supreme Court on May 27, 2009 to fill a countywide vacancy created by the retirement of Judge Francis J. Dolan. The appointment ends on December 6, 2010. Kull has sought judicial office previously. In the 1994 primary, Kull was a candidate for the countywide Durham vacancy. At the time, the CBA rated him qualified, saying "Kull is a hardworking and diligent attorney with broad legal experience. Kull would be a fine addition to the bench." A search of Law Bulletin archives on Westlaw reveals that Kull also applied for an associate judgeship in 1997. John A. Wasilewski was serving as an Associate Judge when the Illinois Supreme Court tapped him to fill a vacancy in the 15th Subcircuit created by the retirement of Judge Marcella C. Lipinski. Wasilewski's appointment was effective May 6; his appointment will also terminate on December 6, 2010. Wasilewski was a member of the first graduating class (in 1978) of what was, briefly, the Lewis University College of Law (the law school is now part of Northern Illinois University). An October 2008 Law Bulletin article noted that 17 of the roughly 300 members of that graduating class became judges. According to the Law Bulletin, Wasilewski co-chaired the 30th anniversary gathering along with Cook County Associate Judge Gloria G. Coco. Wasilewski joined the State's Attorney's office after law school; he became an Associate Judge in 1988. John Flynn Rooney's 1997 profile of Judge Wasilewski in the Law Bulletin noted that, while an ASA, Wasilewski "was known as a 'law guy,' or someone who diligently read the most recent criminal law cases."